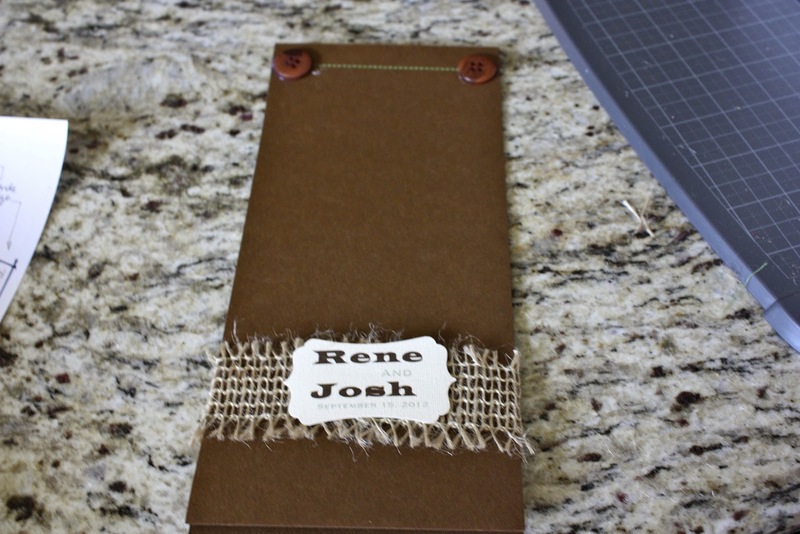 So like many of the other things I made for my wedding, this inspiration probably came from Pinterest or Etsy. Many of the crafts I find on Etsy are fantastic, but pretty pricey, and so I try to make them myself. I kinda understand the price, because a lot of work and time can go into things once you start. 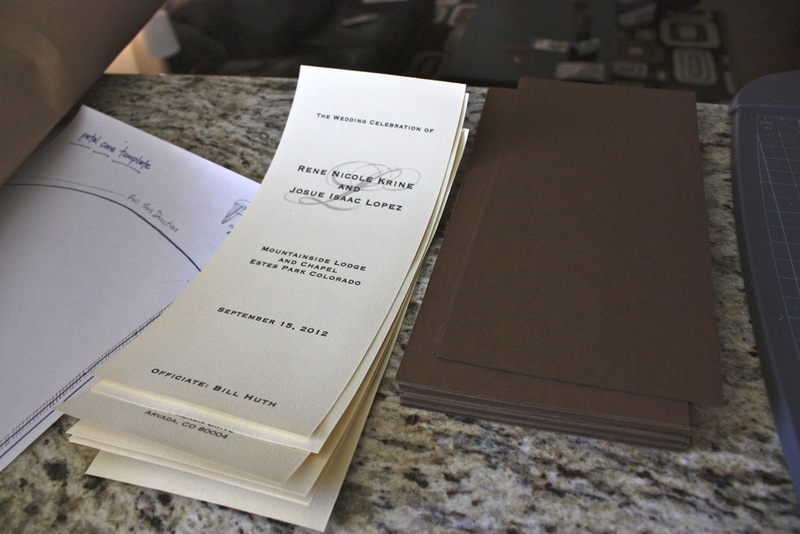 The wedding program was kind of a last minute thought for our wedding, I honestly hadn't really planned on it, but decided that it would be a nice thing for people to look through and at least use as a fan if necessary. We also had a few unique readings for our service, and thought it would be nice to provide the names and authors of the readings so people could follow along. The first thing I needed to create was a custom label with our names printed on them for the cover. I went and found the largest decorative hole punch that I could find, and also bought some neat linen card stock with a cool texture to print the labels on. Then I went on Microsoft Word and created a label template using the measurements on the box for the hole punch. 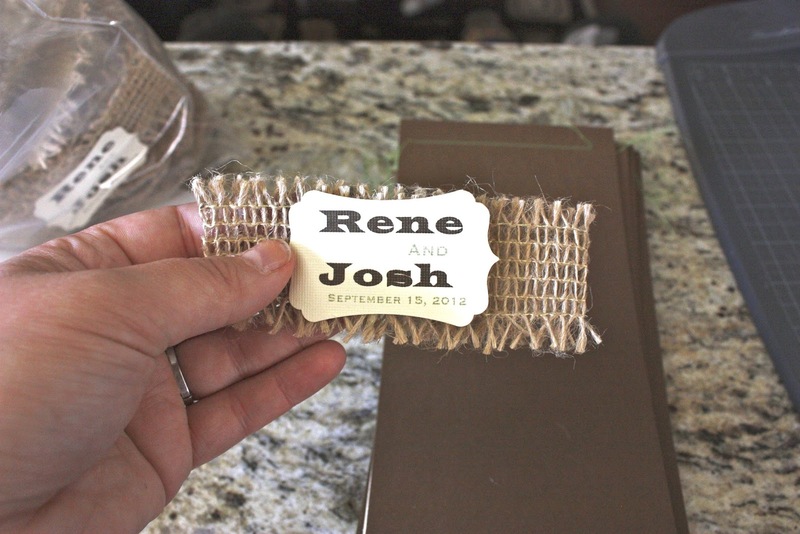 I typed our names and wedding date in a country style fond in our colors, and printed out sheets. Then I proceeded to punch about 150 of them! That alone was time consuming, just making sure everything lined up well and that the "label" had come out of the printer well. Make extras. After they were all done I thought they looked really great though, I wish I had thought of another way to use them they were so cute. The next thing I did was create my program. I decided to use a 4x9 template and planned on having three sheets: the inside cover, the ceremony details and the bridal party. 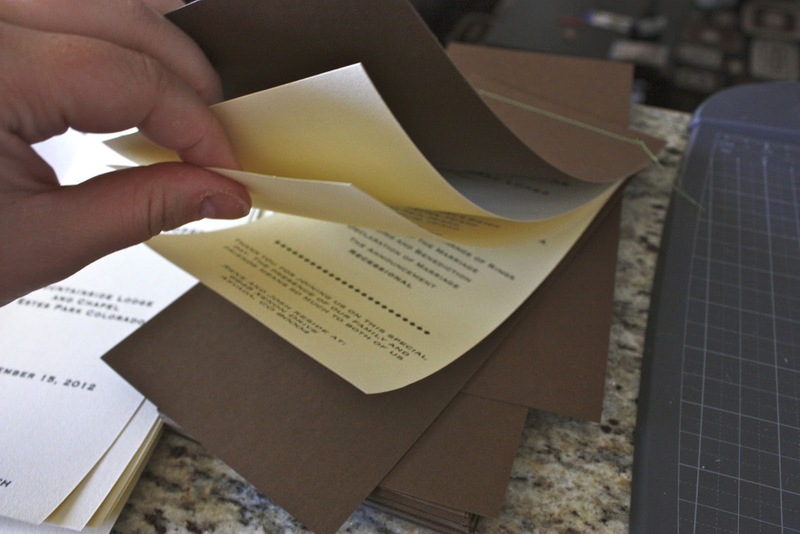 I printed the sheets and cut them to size, and also cut to size my brown card stock covers. Let me give you a little tip when buying card stock, because you are getting married you've probably already made 1000 trips to Hobby Lobby - but I urge you to keep an eye for the 40% or 50% off days for card stock and then load up - cause you will be buying plenty of it. I had planned for 120 programs, so that's at least 60 of each page, counting on 2 prints per page, and then I got 2 covers per page as well, it can add up fast, believe me! 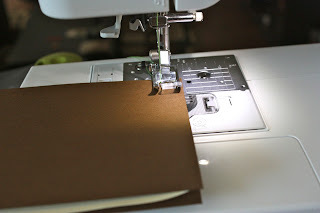 Once I had all my pages done I was ready to sew! 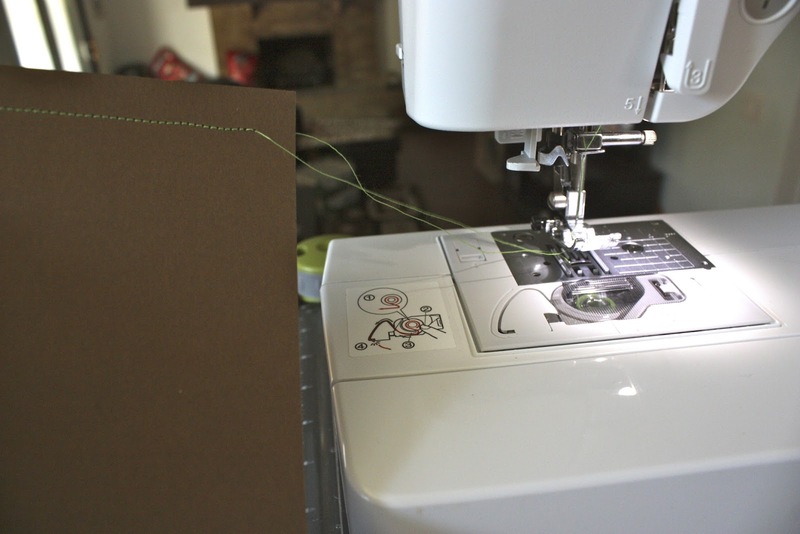 I used my standard needle in the machine, and put some nice green thread in to match our color theme. 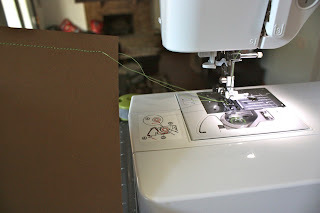 You could also selected a zig-zag pattern for the stitch which would create a nice looking design element if you wanted. 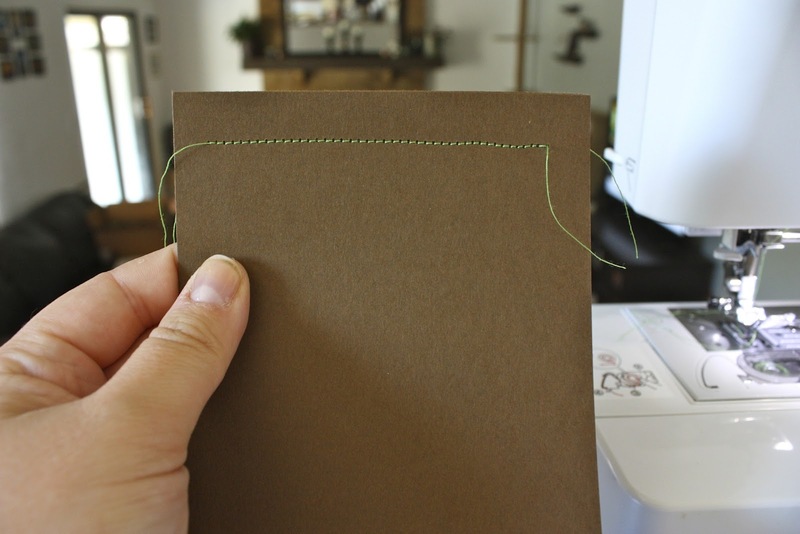 Stack your pages up in order, and run it through starting about 1/4 inch from the edge of the paper booklet and ending about 1/4 inch from the edge. Running it through the machine is easy as pie, seriously probably easier than running fabric through, it takes only a second. Cut your ends, and now you have a booklet. See how nice that looks? Just be sure not to pull on the booklet or strings too hard - it is paper after all, and will rip through if you pull too hard. 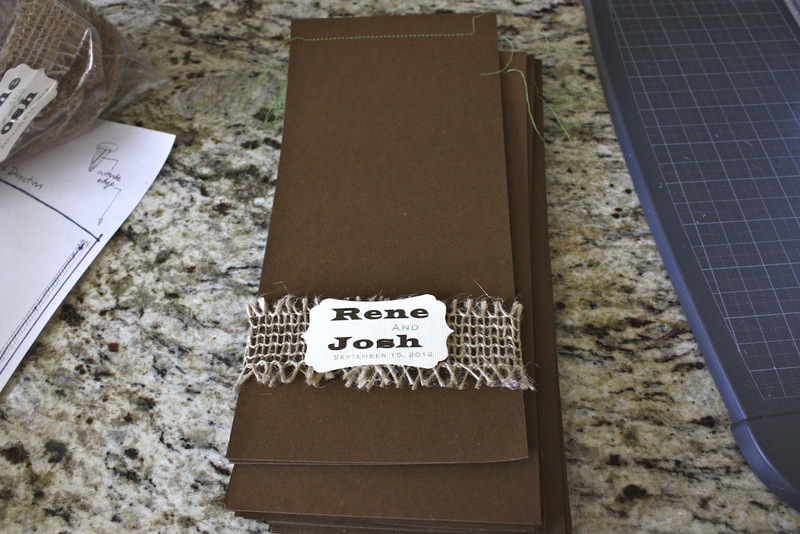 Lastly is the burlap ribbon. 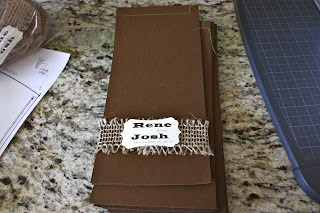 For this we took an blank brown cover as a template, and using the burlap ribbon with a wire inside, molded it to the cover, then behind the label placed a dot of hot glue to secure the ribbon together and also attach the label. 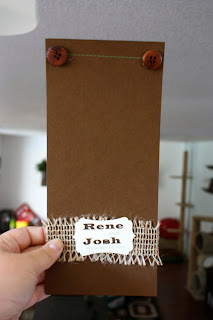 Let it dry for a second and then slide it off your template and onto the program. We also decided to hot glue on rustic looking buttons to the front where the stitches started and ended to add a nice detail to the programs. It is optional, however if you are going to skip this step you will need to knot the ends of your string so it doesn't become unraveled, and maybe placing a small dot of glue on the front and back of the booklet would be wise. I would say that in the end to make the 120 programs I spent about $90, so less than $1 a piece. Cardstock normally .49 each sheet, on sale for 40% off was about .20 each totally around $36 for paper. I had lots of left over materials however, so spending a little time to price out what you need could save you some cash. 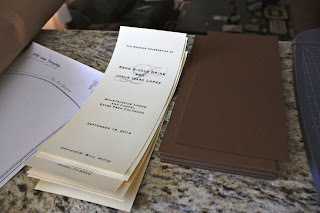 Also, only about half of my wedding guests even took a program - so I had a TON left over after the wedding - so trust me, don't make any extra then you'll absolutely need cause typically a couple will only grab one program to share. It was very simple and easy to make.I have gained a lot of experience from it.I just loved such fan programs in the wedding.